Here are the best and fastest SD memory cards for Canon EOS R full frame mirrorless camera. The new Canon EOS R mirrorless camera has only one card slot that supports UHS-II SD cards and also works with UHS-I and standard SD cards, and it is capable of up to 8 fps continuous shooting and recording UHD 4K (3840 x 2160) video at up to 30 fps at 480 Mb/s. So having some quality 128GB and 256GB card options might help you best on bigger projects, especially when shooting Raw still images and 4K video. And the best choice is the UHS-II memory cards made by leading SD card makers like Sony, Lexar and SanDisk. 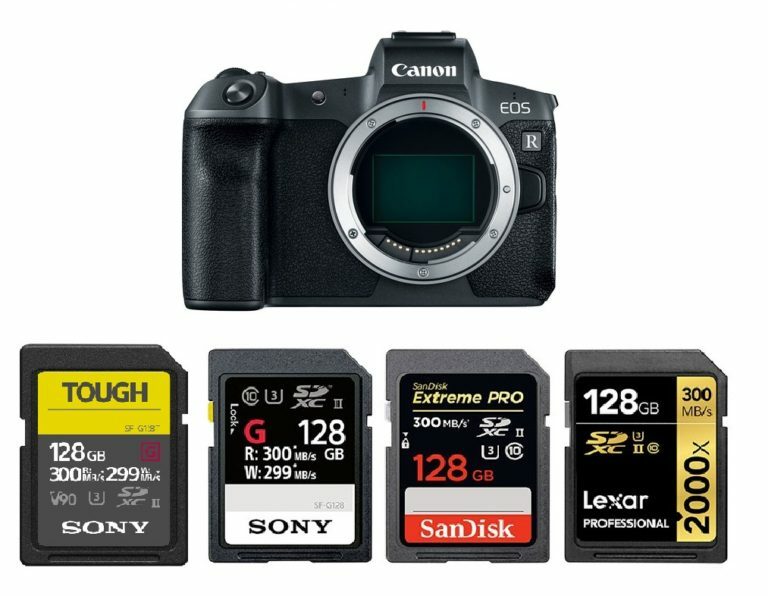 Here is our list of top recommended SD memory cards for Canon EOS R mirrorless camera, including UHS-II SD cards and UHS-I SD cards. Want the fastest UHS-II SD cards with a V90 rating? The Sony SF-G Tough Series UHS-II Memory Cards are the top choice offering maximum read speeds of up to 300 MB/s and maximum write speeds of up to 299 MB/s, available in 32GB, 64GB, and 128GB capacities. The Hoodman SDXC UHS-II cards are also excellent choice that features a read speed of up to 300 MB/s and a write speed of up to 260 MB/s making it easy to transfer large files quickly and efficiently, available in 64GB and 128GB capacities. If you don’t need 90 MB/s sustained write speeds but still want a UHS-II card with extremely fast burst speeds and read speeds, both SanDisk Extreme PRO UHS-II SDXC cards and Lexar Professional 2000x UHS-II SDXC cards are excellent choices, offering read speeds of up to 300 MB/s and write speeds of up to 260 MB/s although only U3 rated. The Canon EOS R is also compatible with UHS-I memory cards, but it will be limited by the write speed of the memory card and the buffer may cause shooting to slow down. The fastest UHS-I SD memory cards are: SanDisk Extreme PRO UHS-I SDXC Memory Card (V30) and Sony UHS-I SDXC Memory Card (Class 10/U3) – both offer the same up to 95 MB/s read speed and 90 MB/s write speed in addition to capturing 4K video.